Mica is an important group of rock-forming silicate minerals, belonging to the subgroup called phyllosilicates. 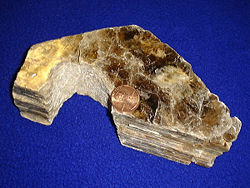 The group consists of more than 30 members, the most common among them being biotite, lepidolite, and muscovite. Members of this group have a variety of applications. For instance, they are good dielectrics that are useful for capacitors and for insulating high-voltage electrical equipment. As heat-resistant materials, they are used instead of glass in windows for stoves and kerosene heaters. Pressed sheets are often used in place of glass in greenhouses. In addition, muscovite mica is common substrate for sample preparation for the atomic force microscope. 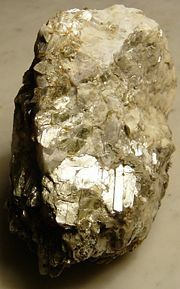 The word "mica" is thought to be derived from the Latin word micare, meaning "to shine." This description refers to the shiny appearance of the mineral, especially when observed in the form of small scales. 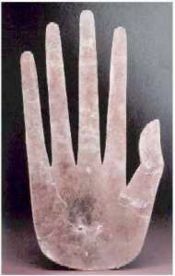 The shape of a hand carved from mica, from the Hopewell culture. Mica was known to ancient Egyptian, Greek and Roman civilizations, as well as the Aztec civilization of the New World. The earliest use of mica has been found in cave paintings created during the Upper Paleolithic period (40,000 to 10,000 B.C.E.). The first colors were red (from iron oxide, hematite, a form of red ochre) and black (manganese dioxide), though black was also produced from bridget or pine carbons. White from kaolin or mica was used occasionally. A few kilometers (km) northeast of Mexico City stands the ancient site of Teotihuacan. The most striking structure here is the towering pyramid of the Sun. This pyramid contained considerable amounts of locally mined mica, in layers up to one-foot thick. Throughout the ages, fine powders of mica have served various purposes, including decorative functions. The colored Gulal and Abeer used by the Hindus of north India during holi festival contain fine crystals of mica. The majestic Padmanabhapuram palace, 65 km from Trivandrum, India, has colored mica windows. Micas are widely distributed and occur in igneous, metamorphic and sedimentary regimes. Large crystals of mica used for various applications are typically mined from granitic pegmatites. Until the early nineteenth century, large crystals of mica were quite rare and expensive because of the limited supply in Europe. Thereafter, the prices dropped dramatically when large reserves were found and mined in Africa and South America. Scrap and flake mica is produced all over the world. The flake mica comes from several sources: the metamorphic rock called schist as a byproduct of processing feldspar and kaolin resources, from placer deposits, and from pegmatites. Major producers of flake mica are Canada, India, Finland, and Japan. Sheet mica is considerably less abundant than flake and scrap mica. 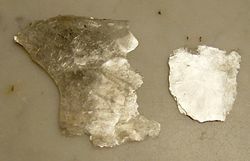 Sheet mica is occasionally recovered from mining scrap and flake mica. The most important sources of sheet mica are the pegmatite deposits. Major sheet mica mining countries are India, Belgium, Germany, and China. The mica group of minerals includes several closely related materials consisting of sheets of silicate tetrahedra and interconnected hexagonal rings. Micas have excellent chemical stability, high dielectric strength, and birefringence. The sheetlike arrangement of atoms explains the nearly perfect basal cleavage of micas. Crystals of these minerals are generally monoclinic or triclinic, but the ringlike arrangement of atoms produces pseudo-hexagonal symmetry. Z is chiefly Si or Al but also may include ions of Fe or Ti. The arrangement of atoms in the different layers of mica can be described as follows. Two layers of tetrahedrally arranged atoms form a sandwich that encloses an octahedral layer of aluminum ions (or other small metal ions). This type of sandwich is then stacked in layers that are separated by "interlayers" of large cations, such as Na+, K+, or Ca2+. The presence of ions between layers of mica prevent swelling by blocking water molecules. As noted above, the general formula may be written as X2Y4-6Z8O20(OH,F)4. Based on the nature of the X and Y ions, micas can be classified as di-octahedral (when Y = 4) or tri-octahedral (when Y = 6). Also, if X corresponds to an ion of K+ or Na+ (or other ion of +1 charge), the mica is called a common (or "true") mica. If X is an ion of Ca2+ or Ba2+, the mica is known as a brittle mica. In addition, some micas are grouped as interlayer-deficient forms, when their interlayer contains fewer cations than the other micas. Hydro-muscovite, with H3+ along with K in the X site. Illite, with a K+ deficiency in the X site and correspondingly more Si in the Z site. Phengite, with Mg2+ or Fe2+ substituting for Al in the Y site and a corresponding increase in Si in the Z site. As chemically stable materials with high dielectric strength, micas are favored for manufacturing capacitors for radio-frequency applications. In addition, they have been used as insulators in high-voltage electrical equipment. Given their heat resistance, micas are used instead of glass in windows for stoves and kerosene heaters. Given their birefringence, micas are commonly used to make specialized optical devices known as wave plates. Aventurine, a variety of quartz with mica inclusions, is used as a gemstone. ↑ Garrett G. Fagan, ed., Archaeological Fantasies: How Pseudoarchaeology Misrepresents the Past and Misleads the Public (Oxford, UK: RoutledgeFalmer, 2006. ISBN 0415305934), p. 102. ↑ The high dielectric strength of micas implies that they are good electrical insulators. ↑ Birefrigence (or double refraction) is the ability of the material to split up a ray of light into two rays. Mineral Gallery. 2006. The Mica Group of Minerals Amethyst Galleries. Retrieved January 4, 2008. This page was last modified on 20 September 2018, at 14:58.